What an incredible night of dancing on “So You Think You Can Dance,” city kids! Our historic Top 4 with its two tappers is phenomenal, but working overtime (again), dancing four numbers each, plus a solo and the opening group number. Fortunately, they’re flawless every time. Sparkly Cat Deeley introduces Nigel, Mary, and guest (and inappropriate joke maker) Jesse Tyler Ferguson to the judges’ table, where they continue to goof around all night for Cat’s bemusement. It’s entertaining, especially when Cat accidentally socks Nigel in the mouth with her microphone. Classic. It’s such a jam-packed evening of dance, there’s no way I can limit myself to just 5 routines. So here’s My Top 7. I’ve been a little lukewarm on the opening numbers this season, but tonight is a huge exception. And not too surprising: it’s choreographed by contemporary favorite Travis Wall. Clad in white, the Top 4 dance an absolutely gorgeous number to Wind Beneath My Wings, flying across the stage with powerful movements. I really enjoy Jessica and Zack’s Spencer Liff Broadway to Ella Fitzgerald’s rendition of Hernando’s Hideaway. Yes, it is Bob Fosse who choreographed the film of this musical, “The Pajama Game,” as Nigel unsurely mentioned. The music is slightly distracting as the tango switches to bluesy fox trot, then to mambo, and back again, but the dancing is good fun, and Jessica’s smoking in that Jessica Rabbit red sparkly dress. Zack’s incredible “Revelations” split leap from a crouched position is mind-blowing, and the show honors it with a great extra slo-mo replay; something they’ve been falling down on the last couple seasons. I’m not always a fan of Tyce Diorio, though frankly that’s more from his appearance in the brilliant documentary Every Little Step, but his contemporary with Zack and Valerie is just stunning. So lovely and quite an acting challenge for Valerie, as Jessie points out, and they both approach it with such genuine honesty. Almost more than the routine itself, Mary’s comment about Zack’s face and the accompanying slo-mo replay makes me tear up. They both dance so beautifully, fully embodying the character and the style. Gorgeous and moving. Pharside and Phoenix really have been a great addition to the choreographers’ roster this season, and tonight’s number for Zack and Ricky is one of their best. The two men do some really impressive lifts, including a bizarrely sexualized sequence (I assume that’s not what they were going for, but it’s kinda how it comes across) that Jesse compares to Mary and Nigel’s relationship. Is anyone else uncomfortable by that correlation? But the rest of the routine is good fun. . . baseball hats and jerseys aside. I’ve said it before and I’ll say it again. I love tap. So of course Valerie and Aaron’s Anthony Morigerato number makes my Top 7. Aaron was never my favorite last season, though I was thrilled to have a tapper in the Top 4, but he’s a good partner to Valerie. The pair has a brilliant non-verbal, three-way conversation; not just between the two of them but with Sammy Davis Jr.’s scatting. The lovely swing movements and fun, clean rhythms shine like their patent leather shoes. Oh my gosh, I can’t even. You can keep your angsty, literally-abstract angel of suicide, emotional contemporary pieces; Zack and Aaron’s amazing Anthony Morigerato tap number—to Billy Joel’s Piano Man, no less!—has me almost in tears. Billy Joel is one of my absolute favorite musicians, and while this song is slightly overplayed, there’s still a darn good reason why. Morigerato is a virtuosic tap practitioner, stuffing incredibly intricate rhythms into the waltz tempo, only resorting to a waltz clog at the end, almost as an homage. He’s so inventive with the music, almost ignoring it yet completely complementing it at the same time. So beautiful. 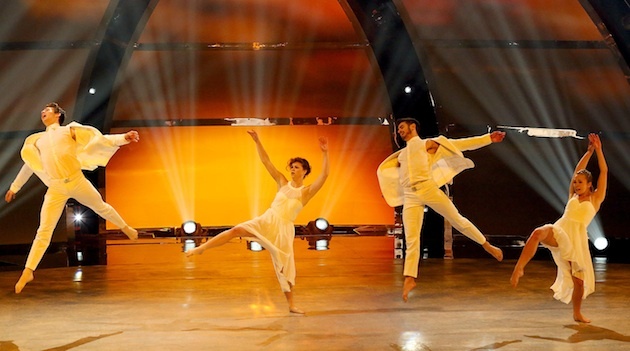 Travis Wall does it again with a gorgeous contemporary for Jessica and Robert, who have to act as well as they dance. They share a rather contemptuous relationship, pushing, pulling, and grabbing each other through expression-drenched movements, as they effortlessly turn emotion into gesture. So what do you think, city kids? Did you vote for your favorite? Who do you think will win? Does Ricky still seem like the obvious winner, as he has since the beginning? Will Jessica prove Christina Applegate right and take the crown? Will Zack come unsuspectingly from behind and steal the throne out from under them? Or does dark horse Valerie have a chance? Cast your votes below!